>> Do you understand your marketing mix? Last week I talked about the importance of having a marketing strategy. And I touched on the marketing mix, otherwise known as the 7 Ps of marketing. Over the next few weeks, we’ll look at each of those Ps in a bit more depth. But first a simple explanation of what the marketing mix is. According to Kotler et al, Marketing, the marketing mix is “The set of controllable marketing variables that the company blends to produce the response it wants in the target market”. Another definition that is popular is “the marketing mix is about putting the right product in the right place, at the right time at the right price”. So, trying not to get too technical (because really, that’s just not my thing), basically, your marketing mix is those things that you can do to influence demand for your product or service. Those “things” are broken up into seven categories. While these are pretty self-explanatory, I will delve into each one in more detail in the coming weeks. From a marketing perspective, it’s generally agreed that you need to get the above right to be able to market your product effectively. Get something wrong and there is a pretty good chance you are missing out on the opportunity to maximise your marketing activities, which in turn reduces your chances or progress in achieving your business goals. And if you don't know this vital information, then you won’t be able to work out the most effective marketing mix. 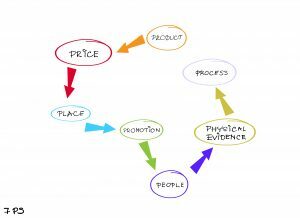 For example, how can you know how to price your product to get the most sales (that will still deliver a profit), if you don’t know what your target market is prepared to pay for it. And if your market isn’t prepared to pay the price you need to cover your costs and make a profit, then you’re not going to make any sales. So, understanding your target market before jumping into developing your marketing mix is absolutely key to your success. Next week, we’ll delve into Product.